Smt. 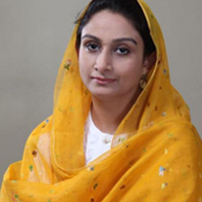 Harsimrat Kaur Badal is a determined Indian politician. She is presently the Minister of Food Processing in the Hon’ble Prime Minister Shri Narendra Modi’s government. Apart from being a great political leader, she is also involved in social work and is a business woman. She is a graduate in Textile Designing. She was first elected as Member of Parliament in 2009 to the 15th Lok Sabha from the Bathinda Constituency and in the 16th Lok Sabha also she is a M.P. from Bathinda in Punjab. In August, 2009 she was made Member of the Committee on Social Justice and Empowerment; and also Member of Committee on Estimates. In May 2010 she was made Member of Standing Committee on Food & Public Distribution; and also Member of Committee on Estimates. She started a project named “Nanhi Chhaan”, a movement to save girl child and trees. An initiative to fight against female feticide and to empower women in rural areas. This initiative has now an active presence in schools, colleges, gurudwaras, temples, churches, panchayats and various municipal centres. Nanhi Chhaan assists in setting up self-help groups (SHGs) for women across the state that in turn spread awareness not only about female feticide but also about other issues such as dealing with cancer, agriculture, farmer’s issues, environmental issues and the ever depleting forest cover. The SHGs also help the women collectively set up small businesses and manage their savings in a more efficient manner. Nanhi Chhaan initiative has opened 75 Silaai centres (stitching centres) at villages, where training is provided to more than 1900 girls in stitching clothes, weaving durries (traditional Punjabi mats) and phulkari (a traditional embroidery technique of Punjab used to decorate shawls and scarves). She also launched an initiative “SAANJH” under which hundreds of textiles training centres were opened and thousands of girls from rural Punjab are trained every year and are imparted training in traditional embroidery art ‘Phulkari’ and ‘Durry’ making and are made financially independent.